With so many reputed jewelers offering some sort of a Gold Savings Scheme, buyers are tempted to invest. However do remember the following advantages and disadvantages of Gold Saving Schemes before you invest. 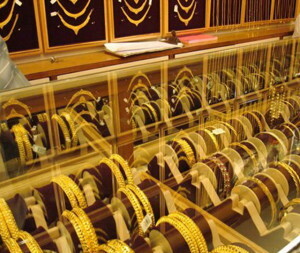 There are a lot of reputed jewelers coming up with Gold Savings Scheme to enable you buy some Gold without having to pay lump sum at one go. This is a good option if you think of it as it allows you to purchase Gold, which is an expensive commodity but is an integral part of our culture, be it family functions, marriages, anniversaries; Gold is somehow the chief guest in these. With such schemes you pay 10-11 installments and the remaining 1 or 2 installments the company bears on your behalf and you can purchase Gold for the total amount you put in these schemes. So are these Gold Schemes really what they are and should you really fall for them and ‘invest’ in them? Let’s See. Notice the choice of words by the companies; they are Gold Savings Schemes and not Gold Investment Schemes. This is because these schemes are not investment schemes per se. These are mainly a business model that ensures sales and is a strategic initiative. However there are certain Advantages and Disadvantages of such schemes, and you should keep them in mind before deciding to put your money in them. We must understand that these schemes are NOT investment in Gold, but are just sort of savings for Gold. This is because firstly you are not putting money in such schemes with a pure focus on returns as much as you are putting it for buying Gold. Even with the company paying the last couple of installments on your behalf you do not get more than 8-9% on your investment. This return you could have got from any regular FD or RD account. In fact these schemes are a bit like Recurring Deposit itself, where in you put aside some money regularly till it matures. Only difference is that in case of RD, money on maturity is free for you to use the way you want and not just for Gold itself. As mentioned above, it is not investment in Gold and the money you invested or put in such Gold Saving Schemes can only be used to buy Gold Jewellery. In case of normal investments, you can use the accumulated amount and returns to monetize your funds or in other words use it as you want or invest it elsewhere. But in gold schemes you cannot do so. Also in case of such schemes if you were to sell your jewellery, you will have to loose making charges. Even when they say ‘zero making charges’ on the jewellery you purchase from them at the end of such a scheme; read the fine print. It is more often than not on ‘selected range’. What if you do not like to buy the designs they offer in ‘selected range’ and need to buy something else? In this case again the making charges negate the returns earned and making charges are the main factor in these schemes as this is why jewelers will not allow you to purchase Gold coins or Bars, but only allow Gold Jewellery to purchase. Gold Savings Schemes are designed to guarantee future sales. It is obvious that the person ‘investing’ in such schemes will have to buy the jewellery from only that jeweler, and it will be mentioned in the terms and conditions. So once you start paying your installments it is an assured sale of Gold Jewellery for the jeweler and that too only jewellery, and not Gold bars or Gold Coins, so again, making charges come in to the picture. You have to buy gold jewellery only and from that seller only, and hence is a forced sale and not an investment. In such schemes, your gains will be only if the Gold prices have gone down at the time you purchase the jewellery, but if at the time of redemption the Gold prices are higher, then your accumulated money will buy lesser value of gold jewellery. This is opposite of what happens when you invest in Gold through buying Gold Bars or Gold ETF, e-Gold etc. as in that case with each monthly installment, you are actually accumulating that much portion of Gold at that time itself which you can sell off when price appreciates to earn profits. Gold savings schemes can act as a savings tool for those who are not that disciplined when it comes to saving regularly or someone looking at a simpler option to save some funds for a short term and does not get the ETFs and e-Gold fundas. You are developing a habit of savings and this can be continued even when the gold scheme matures. Similar practice can be adopted for any other investment instrument like SIP for example. This habit can be used into a full-fledged investment oriented approach towards other avenues like SIP in mutual Funds, recurring deposits, PPF, or systematic investment in Gold itself but through more return oriented schemes like Gold ETF, e-Gold etc. Also Read: Why Women can be great with Personal Finance? These schemes are also beneficial if you will need some Gold jewellery or plan to buy some jewellery in the next 1-2 years due to some function or marriage or gift your wife or girlfriend for anniversary or birthday, may be. In such a case chances are if you were to go and buy the entire Gold at one go today, you may fall short of funds. In such cases you can always start to put money in such Gold Schemes by some reputed jeweler and space out your payments systematically and buy the Gold at the end of the scheme. So to sum it up, Gold Savings Schemes are NOT for investment and those looking at it as a means to start their Gold Investments should stay away from it and consider the other options for investing in gold that you can find here. But if you are someone who would need to buy Gold jewellery in the next 1-2 year time, then this is definitely something you can opt for. However only go for reputed jewelers with trusted track record. You can refer here for the best Gold Savings Schemes in India currently.